Design Thinking <—> Design Doing — Beam Inc.
Design Thinking is essential to creating a future of innovation. The leading universities like Stanford Design School or the Rotman School of Business at Toronto, as well as major corporations around the world use design thinking as a significant tool for understanding and developing innovation. Design Thinking grew from the early work of Buckminster Fuller, one of the greatest engineering design thinkers of the 20th Century. Today it has been made famous and accessible by IDEO. Design thinking is an essential tool for innovators in all fields, from industrial designers to fashion designers, to university administrators to brand and business model builders. To help understand this important framework for innovation, we created a one-page model capturing the heart and mind of Design Thinking. Using this model, we will explore what Design Thinking is and does. Develop a deep empathy for the customer, an understanding of their pains and possibilities, and through the exploration actions, harvest disruptive insights that lead to unexpected solutions. The two-way arrows show that each of the four action areas contribute unique Empathy and Insights to the center, and each action area draws and deepens from the others’ insights too. First, frame the problem or challenge you’re addressing. Whether you spend two thirds of your time defining the problem or not, it is important to frame the right question you are trying to answer. 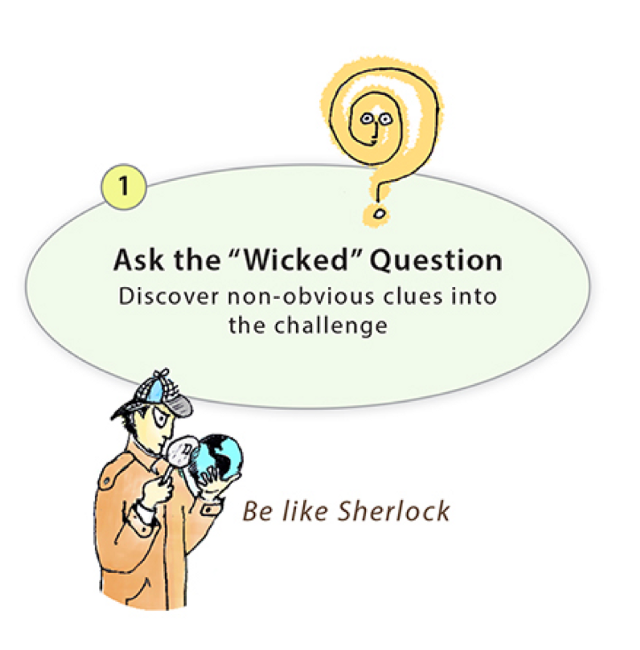 You may state the “Problem As Given” (PAG) at the beginning of your design process only to discover through your Wicked Question and Be Like Sherlock (acute observation) explorations, that it was not the key question or problem. In your explorations at this stage, you want to discover non-obvious clues that will lead to a new framing of the problem. Don’t accept the PAG. When a client gives us a problem statement they want to address, we nod respectfully but know that, in this first step, we will most likely uncover the deeper, truer challenge. How well we reframe the question/challenge determines how well the other three Design Thinking Actions proceed. The Past…look back to the past that led to the challenge…there are a lot of non-obvious and valuable insights in the history of the company or problem. The Current Experience…remember you are building empathy and insights into the customers’ experiences, so you want to observe them first hand as much as possible, not just study second hand research data. The Future…look at the future context for the customer experience, including the Zeitgeist trends and shifts in the greater world, changes in the economy or social dynamics, new generation’s values shifts (like Millennials), technology disruptions, etc. Problem As Given — How can we sell more heating parts to our client operating plants? Problem As Given — How can we improve schools to educate gifted kids? Innovation Strategy — this begins the moment you define your wicked question. Any strategy has one big job to do…Define the big goal (and handful of objectives) you must meet to attain innovation success. A good strategy is a good story so your innovation strategy is a story of what your innovation will do to create value and enrich life for your end user and you (always include yourself and your business in the big outcome for the innovation). You start developing your innovation hypothesis from the very beginning, but hold it loosely. As you move through the four Design Thinking action steps, you want to be open to the valuable insights each yields and use them to refine your living innovation strategy. You will want to continually and consciously evolve your strategy. At the beginning and end of each step, pause to harvest your insights and shape your strategy so everybody is on the same page before you move forward. In this second step, go beyond defining and reframing the problem. Here you work to deeply understand the customer by immersing yourself in their world…learn who they are, what is important to them (values), how they solve problems, how they make their decisions and choices, what gives them pain, what delights them, and what they hope for the future. To create a great experience for your customer, first you have to experience their world. “You don’t create value by solving symptoms. You have to aim innovation at solving underlying causes.” — Mark Payne, founder of the innovation firm Fahrenheit 212. Dive Deep —How deep? You have to dive deep enough to understand enough so that later you can imagine and create a solution that hits at three levels…Surface, Basic, and Deep. The story of the first Apple iPhone offers a good example of these levels. Surface Level (Heart)—Here, you are working to create a solution that connects on the aesthetic and emotional level, capturing the customer’s heart. You create a solution that is appealing and delights them, making them fall in love with the desirability of your offering. It should look and feel better than other solutions. In science, they call it the “elegant solution”. To do this, you have to understand the end user’s aesthetic sense and desires. You have to understand how any delightful solution reflects on them and their identity. Emotional connections open up feelings about ourselves, so understanding the emotions and feelings that resonate most with your customer is the first step. This is even more important in the B2B world than the B2C market. When business leaders make a decision to purchase a significant product, they put their reputations and their careers on the line. If it doesn’t make them look good, then it doesn’t deliver on the promise. iPhone Example: The new iPhone, when it was first introduced, was the coolest looking, aesthetically appealing smart phone any one ever saw (“Oh, Wow”). It made all other phones look clunky, awkward and unattractive in comparison. Basic Level (Head) — Here your job is to create a solution that doesn’t just look and feel good, it goes to the basic function of delivering a unique and better solution. Here you connect on the rational level. It can be designed and explained with logic and data. To do this, determine what functional benefits they may want from a solution (even if they can’t tell you)…not less, not too much more, but just right. What results could you deliver to set you apart from all other solutions in their eyes? iPhone example: The iPhone provided game changing new functionalities on a phone no one had seen before (“Ah, Ha! I can see all the amazing things it can do”). By teaming up with hundreds of thousands of creative app developers, Apple gave people more useful options than they ever imagined. Deep Level (Belly) —Here the customer feels the solution in their belly or gut. The solution fundamentally changes how they relate to things, even how they go about their lives. Innovation at this level challenges you to create solutions and experiences for the end user that invite them to make a change in their own behaviors. Your challenge is to understand the underlying system so you can change the rules of the game…creating a new category, field, or industry while making a solution that grabs people at the gut. Instead of simply rethinking the product/service, rethink the ecosystem of customer experiences and the solutions that serve them. At this level, things are complex for you, but easy for the customer, delivering a seamless, sophisticated experience. Your solution can even feel magical. To do this, you have to deeply understand what motivates your customer, what will reach to the higher levels of the Maslow hierarchy of needs…like needs for self-expression and actualization. iPhone Example: When iPhone purchasers first started using it, they discovered it wasn’t really a phone, but a primary, go anywhere device for creating and communicating (“Oh, Yeah! I get it, it is the amazingly versatile extension of me”). It quickly became part of them, their lives, and changed how they related to one another. Fulfilling higher needs of creative expression and connectivity became possible wherever they went. To be able to provide this, Apple had to build a whole new interconnected system, which they had begun with the earlier iPod music system, then linked to iPad tablets and Apple computers so that all things sync to create a seamless experience. In the B2B space, smart companies provide an entire eco-system of continuous connection and support that expands the benefits of buying from them. For example, organizations like Salesforce.com and Oracle provide a continual flow of content, insights and information to their customers. They create “communities” or leader councils with their customers where they can learn from one another and co-create new solutions and ideas. They have learned that business people don’t just want things, they want experiences, insights, and connection. This all works to deepen the connection to their customers and they gather insights into their customer’s future needs that catalyze the next generation of innovation. To go deeply through all three levels, you can’t just observe and do secondary research on the customer’s world, you have to participate in it enough to feel what they feel, experience what they experience and sense their motivations. It helps if you ARE them, walk in their shoes, become deeply empathic to what is important to them. You can also deepen and enrich your understanding by “hanging with those who know secrets”. You want to hang with people who are thinking and living in the future world you want to take to your customers. Their insights can be exceptionally valuable to your innovations. For example, if you want to develop a toxin-free line of children’s clothing, find a toxin-free t-shirt company to talk with that has already solved some of these problems. Their “secrets” will help you accelerate your development. Only when you uncover insights that disrupt old assumptions do you start to reveal unexpected solution ideas for each of the three levels. Then you can truly innovate in your product experiences, brand and industry. This is the time to mix the insights with your intuition, take leaps into the future, play, dream and envision, and collaboratively generate scenarios that can lead you to newly possible areas of solution. 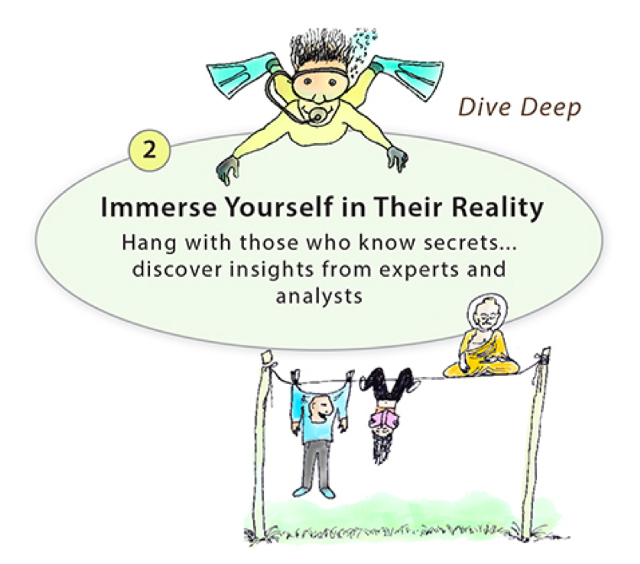 The insights you gained from action areas 1 & 2 will give you ideas for what can be imagined in the future. Whether your solutions eventually become hard products, software, a system or process, entertainment or a service, they all result in a better customer experience. Every product or service is an experience generator for a customer. 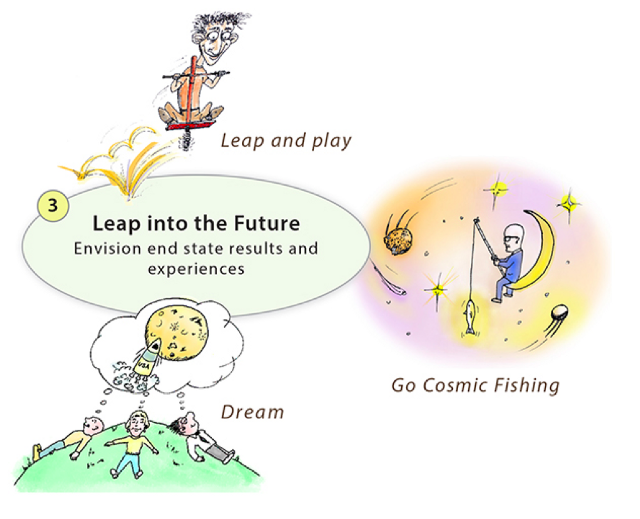 Taking your leap into the future is all about imagining the best possible experience you can give your customer or audience (which could also be your own employees or stakeholders). Keep in mind the experience you create will be judged by two major criteria: Does it create value for me and does it enrich my experience of life? It is essential you give yourself the freedom to Leap & Play, be as free as a kid is to imagine new possibilities. Children naturally give themselves the freedom to leap into an imagined future when they play, creating an alternative universe of new stories and experiences. In their imagined universe, they play active roles and improvise as they go. Watching them, you see they alternate between playful seriousness and uninhibited laughter. They take a simple box and turn it into a rocket ship. They use whatever they have around them and incorporate it into their play. You probably know the famous story of Einstein as a young man. He imagined himself riding his bike on the beam of sunlight he saw in the sky, which helped him wonder about how fast light can really go, and what the relationship between time and space might be. This playful imagining eventually led to his innovation — the Theory of General Relativity. Throughout this stage of design thinking, be like a child — keep it loose, playful, fun and full of laughter. In this Leap & Play stage, you will call upon your intuition. Go “Cosmic Fishing”, as Buckminster Fuller called it. Find time to get quiet, letting your logic and rationale rest and allowing the “fish” of intuitive ideas swim to you. Sometimes intuitive thoughts come as one big whale of an idea but more often you find yourself catching many small fish that contribute to a big feast for the solutions celebration. It is important to share the big dream early on with your team, stakeholders and co-creators, building their enthusiasm for your project. Bring them together and envision the dream coming alive, along with the possible solution scenarios. Here you will draw from your discovered insights and intuited ideas. At this time it is important to play out multiple, creative ways you might achieve your envisioned future. Develop a Vision that Creates Value and Enriches Life — Remember every great vision provides clarity on how you will create value and enrich life. Even a vision for a product has to go beyond simply an attractive, clever product. It has to include a clear picture of the value you create for the customer and for the company. After the creative magic of innovation, when all the shaking of rattles and drumming is done, it has to “grow corn” as any shaman will tell you. Value can mean money, or brand benefit, or strategic value to growing the business. The innovative project should enrich the lives of those who create it and enrich the experiences of the end users. How will our moonshot create value and enrich life? Innovation is inherently paradoxical…it needs the big dream and the tiny details to make it work.Shorting one and overemphasizing the other will result in an off-kilter solution that won’t work. Make sure your dreams and vision are bold, clear and inspiring (doing the right thing) so that your prototype development work can be robust enough to deliver on the vision (doing things right). At this point, you don’t just envision and think forward…you build forward. Once you have a vision, a wicked challenge, and scenarios for producing the desired solution, you need to design and develop the specific product/tech/communication/system/business model solutions that will deliver on your vision. Begin by building mock-ups and prototypes. These eventually lead to the final product, process, or system. For example: What if we didn’t try to compete with established tea companies, who use the leaves of tea trees? What if we didn’t use tea leaves? What if we made good-for-you “tea” from medicinal plants and herbs? The Traditional Medicinal Company zigged where others zagged and created a long thriving medicinal “tea” company that is a major influence in the industry. They, of course, didn’t hit on the final solution at first try. They prototyped many versions of their medicinal “teas” business model…prototyping innovative processing, global sourcing, packaging, delivery, distribution…“building forward” before arriving at the process and formula they use so successfully today. Stick Odd Things Together— Make unexpected combinations of things to create something completely new. Here the use of “combinatory creativity” is valuable. The Apple iPhone is a great example of this. Apple wowed the world by combining a phone, camera, video, computer, e-mail and messaging, writing and reading tools, GPS, etc., into one sleek and beautiful device that fits in your shirt pocket. This was a brand new solution compared to the traditional big upfront purchase of enterprise software. Later, Benioff created Chatter — an enterprise collaboration tool that gives people access to ideas, insights and knowledge and resources for product development, content creation and customer acquisition. It uniquely combines the best aspects of Facebook and Twitter for business use. Innovators, like Apple, Traditional Medicinal and Salesforce.com have the ability to turn things on their head and stick odd things together to come up with unexpected solutions to a wicked question. Many times they identify the need and wicked question long before the customer ever thought of it. People didn’t know they needed an iPhone until they saw it in the store…that’s the sign of true innovation. 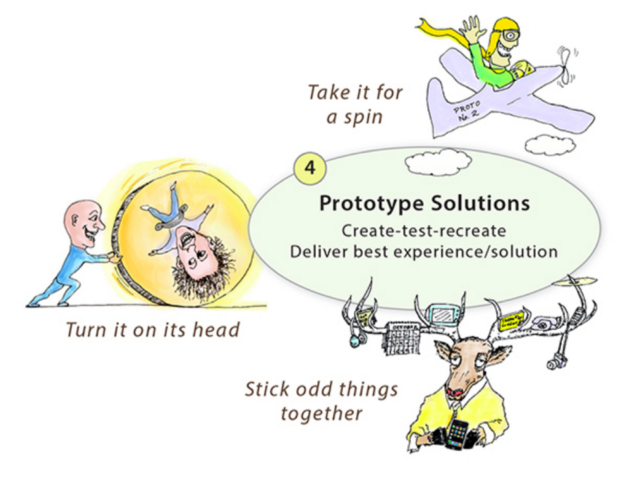 Innovators create the new product or new business model through the iteration of many prototypes. They build forward…creating-testing-recreating the new solution prototypes many times before they hit on the final solution. In this iteration process, they gain powerful new insights about what does and doesn’t work. They learn by failing. In fact, great, unexpected innovations gain their greatest robust value through the tempering process of building, failing, redesigning and testing. Continually “test” your prototypes as you go — a good prototyping process includes a strong mix of challenge, critique and debate. Bring out your vision of success from step 3. Use that picture of creating value and enriching life as your final criteria for judging the effectiveness of your prototype solutions. Even if the prototype is attractive and cool, if it doesn’t deliver on the vision it needs to go back for another round. Effective prototyping is driven by the innovator’s “bias toward action”. They want to build it, see it, hold it in their hand and are always eager to see others use it. “Progress, not perfect” is the imperative at the early prototyping stages. After optimizing the learning from the early prototyping process, the innovator is anxious to refine it and get it “perfect enough” to put it into the hands of the customer. The customer and market will often signal to the innovator when it is time to redesign and come out with version 2.0. This one page model of Design Thinking is a circle…even though it has steps one to four, it isn’t necessarily linear. You may get all the way to prototyping solutions only to find you need to go back to investigate more about the customer or call upon other experts (people who know secrets), to gather fresh insights that enhance your ability to generate robust final solutions. The best way to understand Design Thinking is to do it. Apply it in small projects and then move into gigantic projects. Design Thinking is primarily building and doing.